Arizona offers a mild winter and hot summer, and to maintain a garden, you’ll need plants that are hardy from zones 5 through 10, depending on the individual location. The U.S. Department of Agriculture's hardiness zone ratings shows the average minimum temperatures of a region. This way, when you buy plants in the hardiness zone for your state, you know your plant can handle the temperatures. 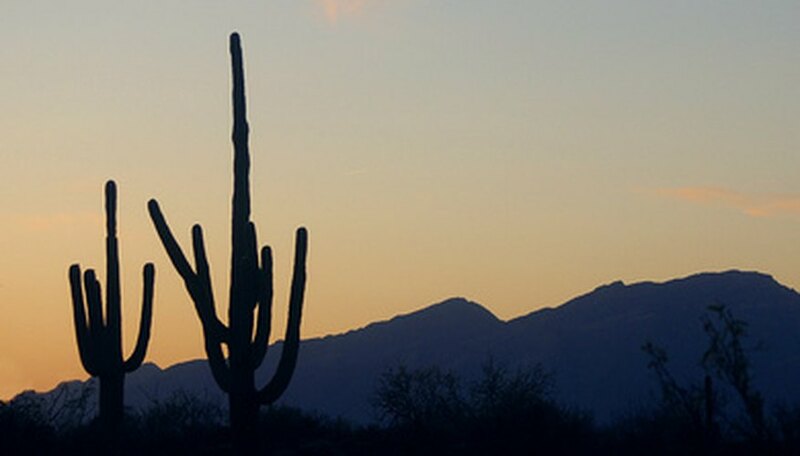 For Arizona, it ranges from zone 5 (minimum -20 degrees F.) to zone 10 (minimum 35 degrees F.). Larkspur is from the buttercup family of plants and botanically named Consolida ajacis. It is an easy-growing annual that attracts hummingbirds. It grows 2 to 3 feet tall, and its bright-green leaves are feather-like. The flowers are on spikes, and the colors depend on the cultivars. It is hardy in zones 3 through 11. Propagate via seed in full sun with regular watering. Nasturtium is from the nasturtium family of plants and botanically named Tropaeolum majus. It is a fast- and easy-to-grow annual that attracts hummingbirds. It grows up to 5 feet high, and its pale-green leaves are 2 to 5 inches wide. The flowers are 1 to 2 inches wide, and their colors depend on the cultivar. It is hardy in zones 4 through 11. Plant a nasturtium in zones 4 through 8 in spring and 9 through 11 in the winter. Propagate via seed in full sun or light shade in light soils with regular watering. Dwarf plumbago is from the leadwort family of plants and botanically named Ceratostigma plumbaginoides. It is a perennial shrub that grows to 12 to 18 inches tall. The 3 ½-inch leaves are deciduous and go from green to red-orange in the fall. The blue flowers are ¾-inch wide and grow from summer to fall. It is hardy in zones 5 through 9. Propagate via cuttings or division in full sun or partial shade in moist, well-drained soil. Crown vetch is from the bean family of plants and botanically named Coronilla varia. It is a fast-growing perennial vine that grows up to 2 feet tall. The leaves are an inch long, and the flowers are clover-like and ½-inch long. It can spread approximately 15 feet and is hardy in zones 4 through 9. Propagate via seed in full sun with regular watering. Angel’s trumpet is from the nightshade family of plants and botanically named Datura inoxia var. quinquecuspida. It is a fragrant, drought-tolerant perennial shrub that grows 3 feet tall and 6 feet wide. The coarse leaves are 10 inches long, and the trumpet-like flowers bloom in the summer and are 8 inches long with the color varying by the cultivar. It is hardy in zones of 5 through 10. Propagate via division or seed in well-drained soils with partial to full sun conditions.